This work is taken seriously. These guidelines aren’t just published and placed on a website in hopes that someone will read them. 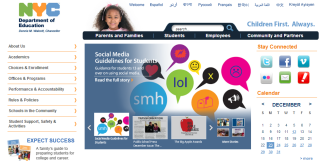 The NYC DOE provides professional development to staff interested in incorporating these guidelines into teaching and learning with classes such as “Using social media to increase teacher effectiveness,” “Supporting the common core with social media," and "A Common Sense approach to prevent cyberbullying." As teachers across the city become comfortable with using social media and understand its importance for student success in career, college and citizenship, it was time to create social media guidelines for students. The guidelines are being rolled out in 2014 with professional development and guides for parents and teachers. It is exciting that the nation’s largest district is taking a stand and not only embracing the resources our students will need for success, but also providing support in doing so. This positions the NYC DOE as a pioneering district that is leading the way for others to follow. How does your district guide educators, parents, and students in the use of social media?